Grilling lemons not only heats them up, which is nice for spritzing on hot food, but helps loosen up and release their juices. As a bonus prize for your effort, they look cool too. For people who like that charred flavor and a burst of sour, even sucking or chewing on one can be irresistible. 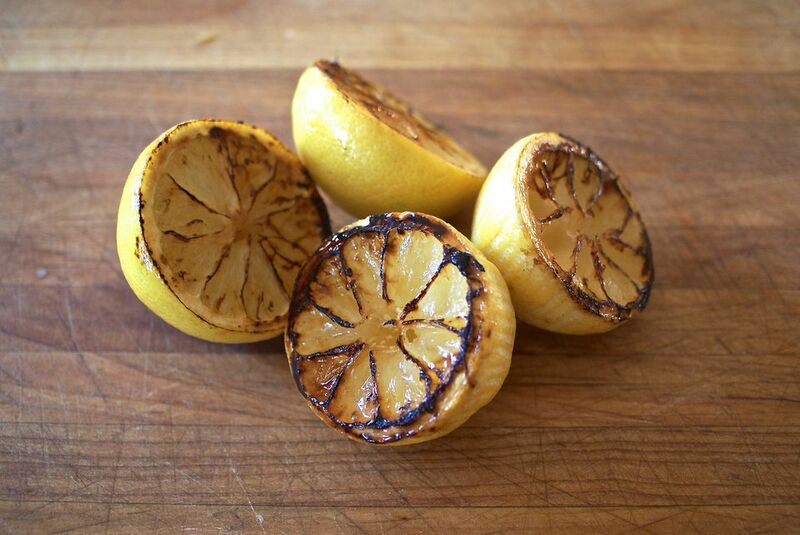 If you happen to have Meyer lemons to grill, they are just sweet enough so that the cut surface will actually caramelize a bit. The heat will also make them taste even sweeter overall. Yum. Grilled lemons are particularly tasty alongside grilled salmon, but they also add plenty of citrus freshness to grilled chicken (roast chicken is good too!) and grilled veggies. In short, if you're grilling something that tastes good with a bit of lemon on it, why not throw the lemon on the grill too? To char on the grill: Heat a grill to medium-high heat (you should be able to hold your hand about an inch over the cooking grate for 3 to 4 seconds). To char on the stove: Heat a frying pan over medium-high heat. Rinse the lemons clean. If you have any plans to use or otherwise eat the peel, you may even want to go so far as to scrub them with soap before rinsing them. Pat them dry. To release extra juice, roll them on a hard surface. Cut the lemons in half crosswise. Optional: Pop out and discard any visible seeds. Use the tip of a paring knife to urge any deeper-set seeds to the surface. This is a kind service to your fellow diners since it minimizes the chance that they'll bite into a bitter seed while enjoying their lovely grilled lemons. Use a pastry brush, silicone grilling brush, or a paper towel to brush the cut sides with a bit of oil. You can sprinkle the cut sides with fine sea salt, too, if you want to add a more intense savory effect to the grilled lemons. Set the lemons cut-side-down on the hot grill or in the frying pan. Cook until the lemons are heated through and charred on the cut side, about 3 minutes. Ideally, you'll cook them without moving them so they char nicely, but adjust them if the heat seems uneven so they char evenly. *Use vegetable, canola, or grapeseed oil for as little flavor as possible. If you're looking for a more prominent flavor, olive oil can bring some robust heft and a bit more of a kick to the party. Just What Is This Crazy Thing?